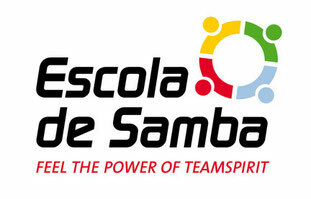 Successful Teambuilding for Soccer Teams - escola-de-samba2s Webseite! In order to be able to survive as a team in modern soccer today, it is important that good individual players can perfectly work together as a team. In many cases, team spirit is mentioned in this context without ever specifying the concrete meaning what team spirit exactly is. Everyone seems to have a vague idea of what might be hidden behind the word “team spirit” - but a precise definition is usually not found. 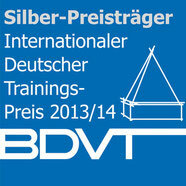 Furthermore, it is often assumed that various team building exercises go hand in hand with an improvement of team spirit. In our opinion, team spirit is a positive feeling that can only be experienced together as a group and that can also transport or rather promote a set of common values and goals. Team spirit is thus a socio-emotional phenomenon that provides the decisive impulse for the functioning of a team, often consisting of a number of individual specialists in respective positions, in order to win games as a real unity. But how can this special phenomenon of team spirit be trained to meet the challenge of competition? In recent years, we have repeatedly had the experience that a well-rehearsed orchestra is an excellent metaphor for a well-functioning soccer team. By saying "after the break they did not find their rhythm again" we normally do not describe incidents in a musical ensemble. We speak of a soccer team that, after the half-time break, could not find real access to the game again. Very important in this context is a musical phenomenon called groove. The term describes a musical state that can emerge when different rhythmic patterns overlap in a positive way. This usually leads to the "happiness messenger", the neurotransmitter dopamine being released. The common groove thus creates a collective feeling of happiness that makes the musician feel good. Therefore, even musical laypeople have a feeling whether they did or did not experience groove, if they simply pay attention to their gut feeling and make a statement about whether they feel well or not. Groove is thus a socio-emotional phenomenon that can only be experienced in a community. Hence, the claim can be made that groove is nothing but team spirit evoked by a musical process. It already becomes clear, how community-forming joint drumming is. The drum has always been the instrument with which people could connect and assure themselves in an increasingly complex and individualized world of community. 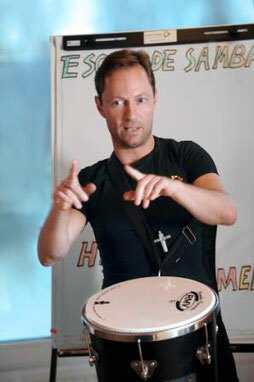 The drum is usually an instrument with which one can playfully enter into a collaborative music session without long previous lessons. With other instruments (such as a violin or a saxophone) it often takes several weeks and months until the appropriate playing technique is mastered so that one can think about playing together in a group with other musicians, not to mention experience the groove phenomenon described above. Even when playing the drums together, achieving a common groove for first-timers is not easy to accomplish, since creating groove requires different rhythmic patterns that complement each other in a positive way. Here Samba Batucada, the music of Carnival in Rio, which exclusively consists of percussion instruments and drums, has clear advantages. 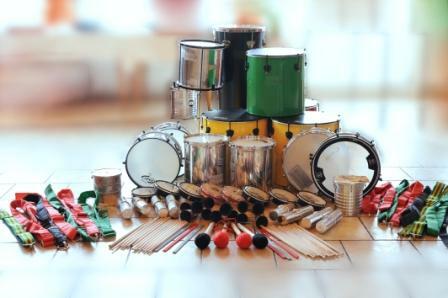 All instruments used in a Samba Batucada drum event have a clear sound spectrum. In the diversity of these different timbres, even first-timers, under guidance, can "hold together" the various rhythmic patterns of each instrument and thus fulfill the musical requirements for the emergence of groove. In addition, Samba music is known for its positive association with the Brazilian enthusiasm and enjoyment of life. The term Samba-Kicker is well established in the German media and is certainly influenced by the many world championship titles that the Brazilian soccer teams have already won and stands for a high game culture and inventive, offensive soccer, which is also characterized by outstanding ball control. Furthermore, Brazilian soccer is closely linked to the samba. But only a little bit of fun while playing the drums is it not enough. Because the positive effects, which are caused by the groove, end in the moment in which the drumming stops. In order to ensure a profound, sustainable effect of team spirit in the team, we tie the collective drumming into a very ambitious goal. 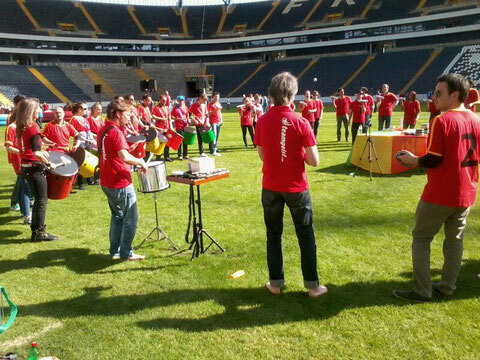 This means that at our teambuilding workshops, we challenge participants to be able to record a Samba Batucada musical piece at the end of the drum event that is so good that you want to listen to the recording again and again. Another challenge is that the recorded piece includes a distinctive samba beginning, various samba groove parts, as well as various solos and breaks. Such an ambitious goal seems almost impossible in the short amount of time available at the beginning of the teambuilding workshop. This high goal, however, can only be achieved as a real collective, as a well-functioning Bateria (Samba drum-group), that is able to respond to the respective other instrument groups. For example, if one group of instruments speed up the tempo, then everyone else has to respond to it and adjust their tempo to make the groove work. Otherwise, the musical process "tilts" and is perceived as cacophony rather than music. On the pitch, this could mean that when a striker attacks and the other part of the team does not move forward accordingly, they create spaces for the opposing team. 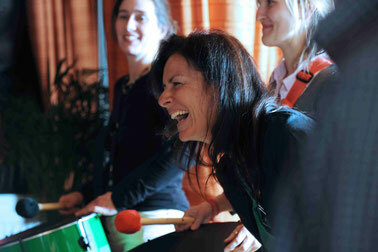 Besides all the fun, the drumming workshop is thus also about solving the challenging task. If the Bateria creates a successful recording at the end, the very positive feeling is spread across the group that they have solved this ambitious challenge as a real team and as a successful Samba Bateria. Now it is about enjoying and celebrating this success as a team (just like a soccer team after a victorious match) and, above all, anchoring it sustainably. With the positive feeling of successfully mastering a real big challenge, supported by the hyped flow experience of the groove, we anchor this winning mentality with Escola-de-Samba-techniques. And before the next real challenging game we can unleash that outstanding emotion and mental attitude, this "we-can-win-ALL" feeling with just a few bars, so that all players are motivated to the tips of their hair in the shortest possible time and go to the field with the best sense of confidence and a winning mindset. There are a lot of parallels, associations and metaphors between a well-functioning soccer team and a grooving Samba Bateria that can perfectly be used to convey the importance of team spirit and its state as a positive experience. The art of this team-building experience, however, is to anchor this team spirit in such a way that this performance-enhancing, communal emotion can be transferred to the performance of the competition and can also be reactivated in the cabin shortly before the match. Quote Doris Fitschen (2016 Team manager of the women's national soccer team): "Developing a Samba rhythm together with the team was a fascinating experience and also great fun. The groove ultimately carried us to the Maracana Stadium in Rio."